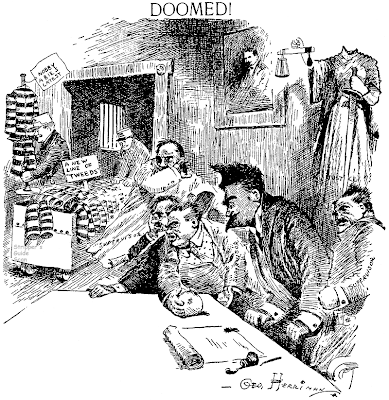 The first cartoon, published March 23, 1907 continues coverage of the graft investigation. The Examiner seems now to be quite sure they're going to get the ringleaders into jail. We shall see.. The second and third are from Sunday the 24th. The first of the two commemorates the horse-racing practice of "getaway days". I'd never heard of this but it seems that it was standard practice, at least back then, to have the last few weeks of the racing season include a lot of races for the lesser horses. The idea was that the owners, usually small outfits, needed at least a win or two to get purse money to pay for their trips home. Races would be stacked up with these 'also-ran' horses so that everyone had a decent chance to make the purse. Some bettors loved these races because the field was wide open and 50-to-1 shots might very well win the race, Others, those who fancied themselves scientific bettors, disdained them. The letter being written in the small panel is pretty hard to read. It says "Deer Mister Gole Dollar -- kin i have the ole job on the shootin' gallery this summer". In the final cartoon Herriman appropriates Fred Opper's famed mule and farmer (without even an "apologies to" line -- tsk, tsk) to comment on the coming era of using automobiles for farming work. My wife, a country girl, had to explain to me the phrase "old dobbin scented the gravy" -- it means that when the horses smelled supper cooking back at the farmhouse they knew it was time to quit work for the day and headed on home. I sometimes buy old scrapbooks of clipped cartoons on eBay -- they tend to go cheap and sometimes I find a jewel among the cartoons some kid or grandma clipped in the old days. Paging through my latest acquisition of this type I found something in amongst the hundreds of Off The Record cartoons (this clipper REALLY liked Ed Reed's feature) something that almost made me kack up a hairball. 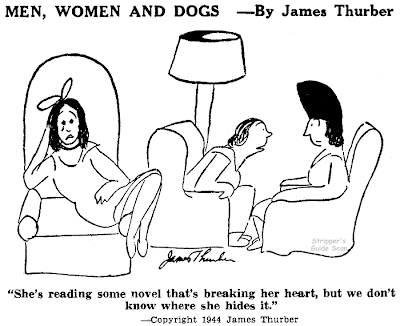 James Thurber, one of the greatest American humorists of the twentieth century, was also an amateur cartoonist. His cartooning abilities were so primitive that it never occurred to him that they were worth publishing. However, his friend and collaborator E.B. White was so tickled by his doodles that he secretly submitted them to Harold Ross at the New Yorker. Ross, too, was taken by them and published a few in the magazine. Readers expressed their delight with the off-kilter captions which seemed to suit perfectly the naive cartooning and Thurber had thrust upon him a secondary career as a cartoonist. 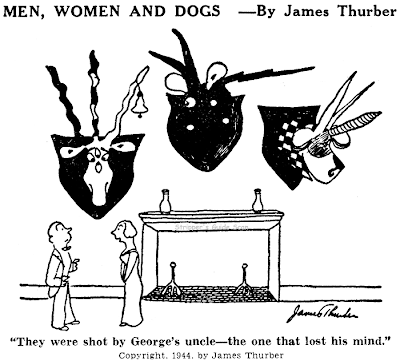 By the 1940s Thurber was all but blind, but continued occasionally to produce his cartoons, now drawing them on huge sheets with his bedimmed eyes hovering just inches from the paper. After the initial amazement of finding the above cartoons in the scrapbook, being a Thurber fan familiar with his history I realized that there was definitely no way that Thurber was producing a daily newspaper cartoon in 1944. 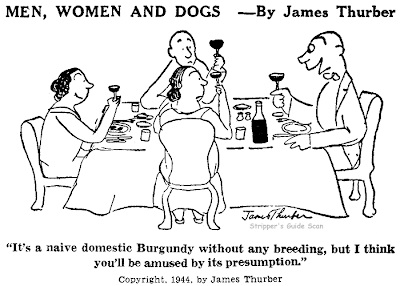 All became clear once I did a little checking and found that Thurber's book of cartoons titled Men, Women and Dogs, was published in 1943. Apparently the book publisher devised the scheme of offering newspapers a very short-running daily sampling of Thurber's work to promote the new book. In amongst the hundred of cartoons in the scrapbook there were only five of the Thurber cartoons, so the feature may have run for as little as a single week. What's odd is that this is the first time I've encountered the series -- apparently the promotion (I'm assuming the publisher gave the series away free) didn't succeed very well because very few newspapers printed them. A few weeks before his abdi­cation from the throne of Egypt, former King Farouk requested and received a set of cards bearing drawings of characters in the "Harold Teen" comic strip, syndi­cated by the Chicago Tribune-New York News Syndicate un­der the pen of Carl Ed, the artist. Like millions of American youngsters, Farouk collects cards that are distributed from time to time with candy cigarettes. A few years ago characters of the comic strips marketed by CTNYNS were stamped on cards distributed with candy bars manufactured by a Cambridge, Mass., candy company. Lacking from Farouk's collec­tion was a set of "Harold Teen" cards, including Harold, Lillums, Shadow Smart, Pop Jenks and other characters. In mid-June Farouk's private secretary asked a collector in Bris­tol, England to supply the set for him. The collector did not have the set and forwarded the request to Col. Robert R. McCormick, edi­tor and publisher of the Chicago Tribune. Col. McCormick turned the request over to the syndicate managers and Carl Ed. A set of cards was assembled and sent to Egypt. With them Mr. Ed sent two original drawings. A note of thanks from Farouk was sent to Mr. Ed and the syndi­cate by H. Husny, the then king's private secretary. Whether former King Farouk has taken his cartoon collection with him into exile, Mr. Ed hasn't heard. Prime Minister Nehru of India told the All-India Newspaper Ed­itors' Conference last week that he "couldn't stand what are called comic strips. I am supposed to laugh, but I feel very gloomy." He said he would "even pay money to escape from them." I order most of my books online. When I saw a Gary Gianni Prince Valiant book pop up in a search I confess I didn't even bother to read the description, I made a beeline straight for the Order Now button. My quick trigger finger on the book ordering button often makes books show up in my mailbox that don't live up to expectations. Especially when doing research I tend to just order everything that could conceivably be of interest and sort the wheat from the chaff as it arrives. It can be a rather expensive indulgence, but on the other hand occasionally I end up with some really great books that vastly exceed expectations. So it is with The Prince Valiant Page. I ordered it assuming that I was going to get a reprint volume of Gianni's work on the Sunday strip. Though that's not what I received, and that's a book I still would be delighted to have, The Prince Valiant Page is one of those unexpected delights that will keep me hitting those Buy Now buttons. What we actually have here is a combination art book, instructional book and history of Gianni's involvement with the strip. The book is full of reproductions of Gianni's pencil sketches, working drawings and finished pages (in glorious black and white), all of which are lovely to behold -- far more beautiful than the postage stamp size color versions I see in my local Sunday paper. Gianni does a great job of explaining his working methods and those of his predecessor on the strip, John Cullen Murphy. Many model photos are reproduced along with the drawings that were produced based on them, an invaluable peek at methodology for aspiring artists and fascinating too for those of us with no such ambitions. 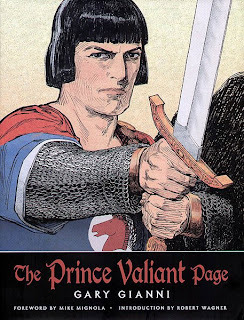 There are a few color Prince Valiant pages reproduced, mostly on foldout pages so we can see them in glorious full tabloid format, a size that isn't used by one newspaper out of a thousand. These are just glorious, and confirm for me the reason that while I really love Gianni's version of Prince Valiant I just can't bring myself to read it in my local paper reproduced in that abominable quarter-page format. The history of the strip, which focuses mostly on Gianni and the elder and younger Murphys, reveals a lot I didn't know about the working relationships. For instance, I had no idea that Gianni was ghosting selected pages before he began taking credit, or that John Cullen Murphy finally handed the strip over to him in such an abrupt fashion, very much unlike Murphy's extended tutelage under Foster. Gianni shows several of his early PV pages along with Murphy's comments and corrections. Murphy's corrections are heart-rending in their constant admonitions to Gianni to drop details and shading that would turn to mud in the printed form. If only these damn newspapers would give strips like Prince Valiant some space! What a glorious page Gianni could produce for us if only they'd give him some elbow room. As it is Gianni's work on Prince Valiant is terrific, but oh, what it could be! While we continue to ponder newspapers' wanton disregard of producing a Sunday comics section that could actually sell papers I suppose we'll have to get our fix of great art from books such as these. So thanks Gary Gianni for this wonderful peek into what is and what could be. Now get busy and find a publisher to produce reprint volumes of those superb tabloid Prince Valiant pages of yours. We can't get them in the newspaper so we're all chomping at the bit to read your Prince Valiant any way we can. Great stuff! How can I subscribe to this blog's RSS feed? I didn't see a button for it . . . I must confess to not knowing anything about feeds. I checked the blogger help, though, and added what I hope you're looking for. There is now a "Subscribe to Posts" option on the sidebar of this page. Let me know if that's what you're looking for. Woo hoo! That did it, now all of your updates will automatically be delivered to my Reader (I use the Google Reader) instead of me having to come to them. Allan sez: "Now get busy and find a publisher to produce reprint volumes of those superb tabloid Prince Valiant pages of yours." Well, good thing I put in that request then. Fast service, too! Seriously, though, that's great but I note the size of the book is nowhere near as large as the color repros in this one (which are 11" x 17"!). Why must so many reprint projects suffer from the same size problems as we see in newspapers? I can see badly reproduced miniature comic strips in my local paper. How about giving me good reason to buy the book??? Here's some samples from the second series (or third if you count a 1918 reprint series cited by Alfredo Castelli which I still haven't gotten around to verifying) of American Old Bill cartoons by Bruce Bairnsfather. Rather than rehash old news, I ask you to skate on over to this post for a discussion of the Old Bill series that appeared in the U.S. All the American Old Bill series are quite rare, this King Features strip series of 1923-24 probably the most common of the three, yet still extremely scarce. Judge Wright was a short-lived strip that never really found its identity. This strip about a city judge who gets personally involved in his cases flounders around between the soap opera and adventure genres. Apparently the police and prosecutors in Judge Wright's domain were all utter idiots because the judge felt it necessary to constantly go out and track down the real miscreants, because it seemed the suspects brought before him were all wrongly accused. Judge Wright had its roots in comic books -- all the creators involved were funnybook vets. 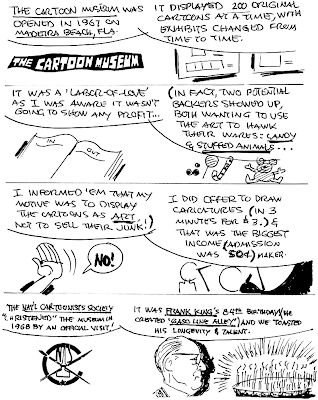 The strip was credited during most of the run to Bob Brent and Bob Wells, neither of whom actually existed. The writer was actually Robert Bernstein who had worked on the Crime Does Not Pay comic book. The first artist was Bob Fujitani, whose Japanese name was perhaps wisely unused since the strip premiered on September 10 1945, a scant few months after the end of the war. Fujitani's art might have been fine for comic books, but on the comics page his oddball camera angles, film noir inking and often mangled anatomy looked out of place. It probably didn't help that, as Ron Goulart tells us in The Funnies, Fujitani was unhappy with the pay -- which is saying a lot when you figure the slave rates paid at the comic books. Fujitani called it quits in December 1946 and was replaced by Fred Kida, another comic book artist. Kida soldiered on with the strip, also lending the proceedings a decidedly comic-bookish air, until June 10 1947. I guess his experience on Judge Wright really soured Kida on newspaper comics -- his next credited appearance in the medium would not be for another thirty-five years, when he'd do a stint on the Amazing Spider-Man strip. George Roussos replaced Kida, yet another comic book guy. He lasted until February 21 1948. The last few months of the strip, which ended on April 3, had no one taking credit for the art, but whoever did it was able to do a plausible, if rush-looking, simulation of Roussos' distinctively chiselled characters.